Mwahahahaha. Welcome horror fans to another Smurfin’ The Web Wicked Wednesday. Somthing a little more low budget today. While I’m talking about low budget, I do intend to review the Paranormal Activity movies as soon as I have got around to watching them, it doesn’t get much lower budget than $15,000 but its resulting success has been astounding. Today’s choice is one of those British written, small cast, National Lottery funded movies that crop up now and again. 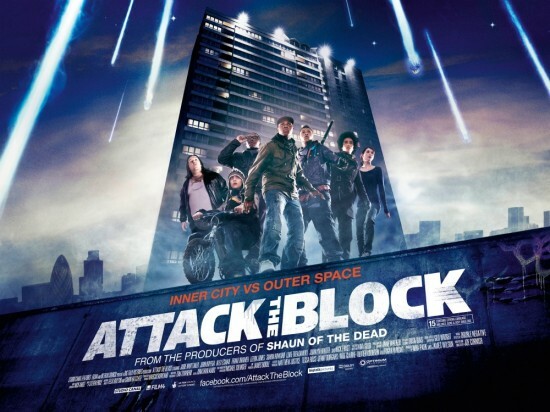 Attack The Block is a sci-fi movie with some social issues thrown into the mix for good measure. My wife saw the trailer for this and quite fancied it. I was going on her recommendation on this one and flying blind I settled down to watch it with the laptop on my knee intending to do other things while the movie was on in the background. The opposite in fact happened and it was the laptop that took a back set as this movie pulled me into its storyline which was pretty simple but effectively delivered. Newcomer John Boyega takes on the role of Moses, the leader of a council estate gang who decide to rob a young lady on here way home. Little do they know that Sam, played by Jodie Whittaker lives in the same block as them and their lives will become intertwined in a story of survival as the entire block of flats that they live in is attacked by creatures unknown. They must learn to overcome the social stigma and previous events of the evening and trust each other in order to survive. The special effects are no match for the likes of Hollywood, but are done nicely as you would expect in say, perhaps an episode of the modern Doctor Who, but are certainly original in design and not over the top so that it detracts from the actual storyline and steals all the limelight. That is not required here. The acting is good, plot thin but deliberate and I hope to see more movies like this written by British folks with hopefully more success. Writer Joe Cornish, who has lent his talents to the likes of Hot Fuzz and also the upcoming Adventures Of Tintin, also directs here as this low budget affair had me entertained for the 90 minutes or so that the movie lasted and the addition of Nick Frost who plays Ron, a run of the mill, long haired, dope loving guy gives the movie a bit of gravitas with the critics. The highlight of the movie for me though was the character Pest, played another newcomer to acting, Alex Esmail, who has the best lines in the movie and delivers them with perfect comic timing and inner city style. I reckon anyone who sees this would enjoy it. Miles better than Cowboys & Aliens, but sadly not nearly as successful. It was a massive flop, but I still recommend it. 7/10 from me. I think we’ll be taking a secret trip to the Moon in next week’s Wicked Wednesday, so stay tuned. I enjoyed this film so much more than I expected! Yes, I loved the trailer, but I feared it would be a case of all the best bits were shown in it and there wouldn’t be much else to it. Well, it turns out the best bits ARE in the trailer, but the rest of it lives up to the promise! It was a surprisingly fun and engaging film which, in a bizarre twist, had me siding with certain gang members as they tried to come good. It’s a creature feature that’s definitely worth watching!